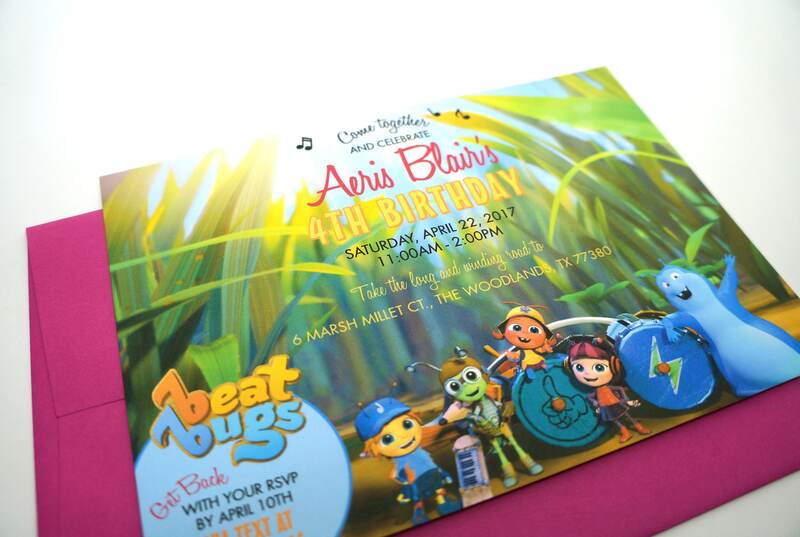 Celebrate your birthday in musical style with Beat Bugs birthday invitations. These are colorful, fun and perfect for any birthday boy or girl who is a fan of the show. This listing is for a DIGITAL version of this invitation. The design is set up to be printed on a standard size paper 8.5" x 11" with two 5"x7" invitations per page. Once the purchase is complete, I will send you a message with what information is needed. You should then receive a proof of your invitation design within 1-2 days. Once a proof is approved, I will send over your digital design and you will be ready to print your invitations! You will have full printing rights to your design and will receive your design in whichever format suits you best (typically .PDF ) for printing ease. The invitations were a big hit! So cute and great customer service. Turned out great! Seller worked with me to tweak some wording and some colors, and got the digital print to me very quickly. Highly recommend!